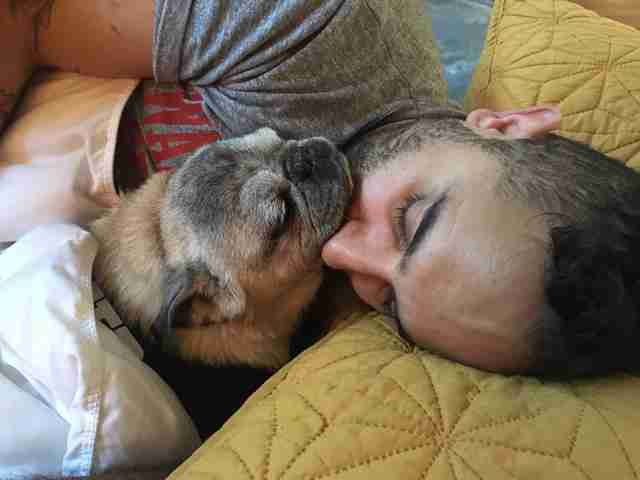 For 11 years, Shorty and his dad Marc have been inseparable. 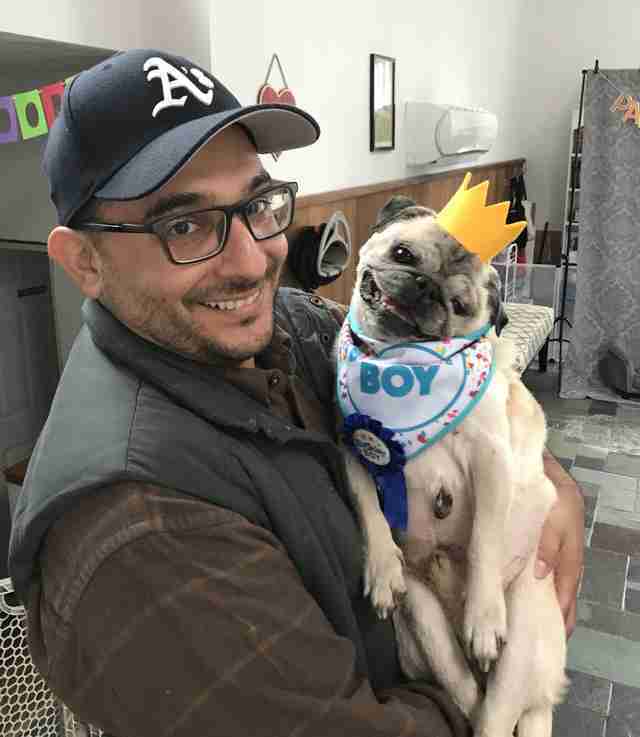 Since the day Marc rescued Shorty from a Philadelphia shelter, the pug has followed his dad everywhere. But at 15 years old, Shorty isn’t as spry as he once was — which means staying home more and more. 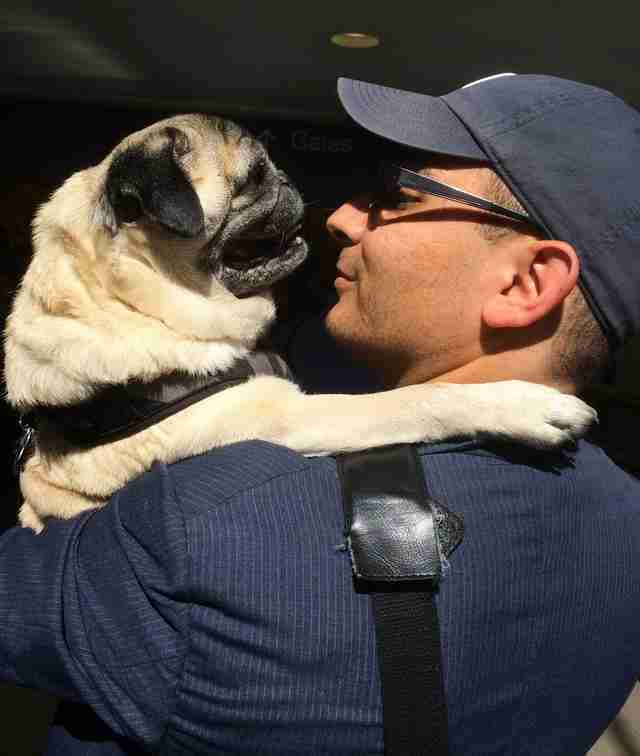 However, age doesn’t make the pug miss his dad any less — which has become a bit of an issue lately. The Peraltas run Vintage Pet Rescue, a retirement home for senior dogs and hospice dogs located in Rhode Island. When it became clear that even the loving attention of his mom and his many senior buddies wouldn’t distract Shorty from his dad’s absence, Peralta started getting creative. Peralta tried putting one of Marc’s shirts on a pillow, but Shorty immediately saw through the ruse and refused to be comforted. It seemed nothing could replace Marc’s warm embrace — until Peralta’s mom had a brilliant idea. A week ago, Peralta’s mom secretly ordered a life-sized dummy from a Halloween store. 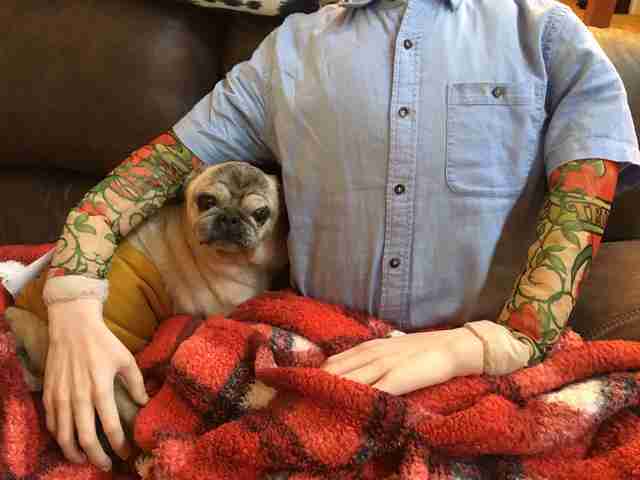 When the dummy arrived, Peralta was skeptical, but she was willing to try anything to ease the pug’s suffering. 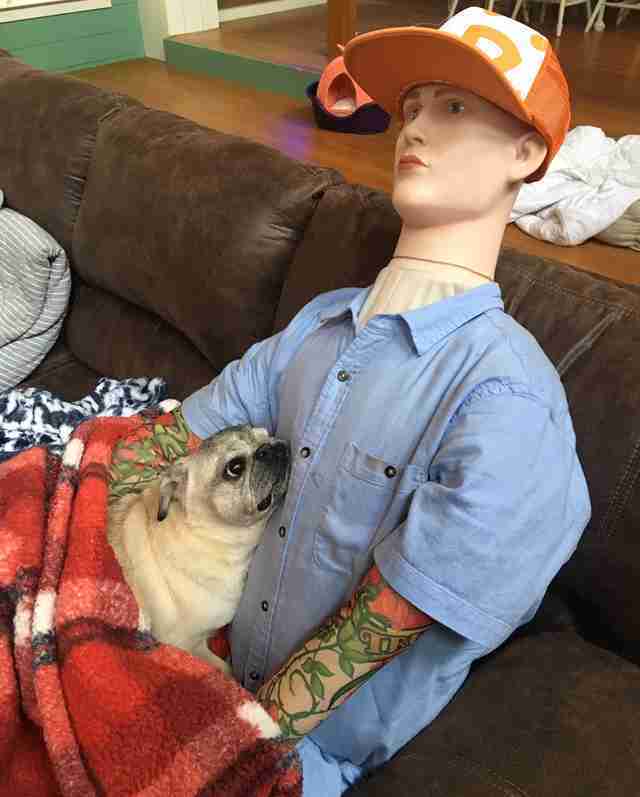 And Shorty isn’t the only one who enjoys the latest stuffed addition. 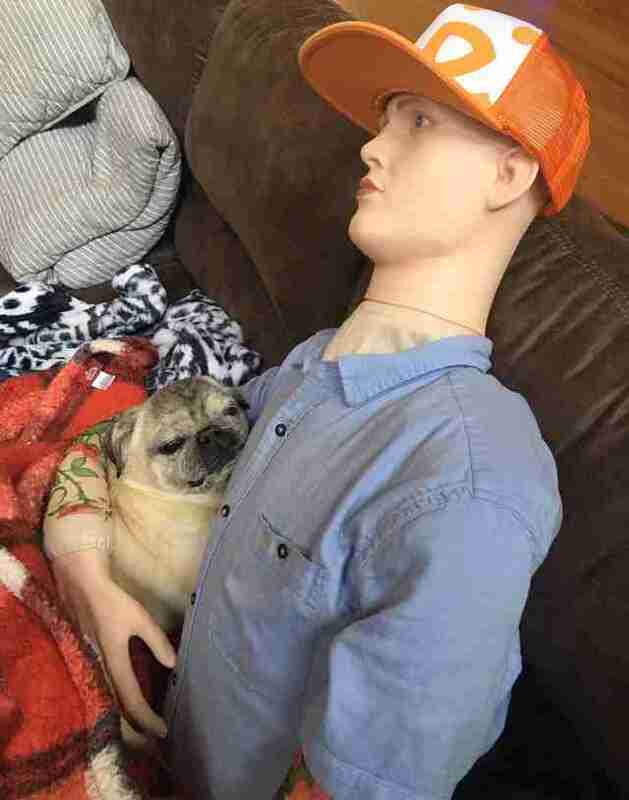 The dummy is so convincing, that Shorty’s younger brother, Bug, believes that it will come to life and play with him. While Marc is glad Shorty no longer suffers when he’s away, he’s also hurt by the dog’s new allegiance. 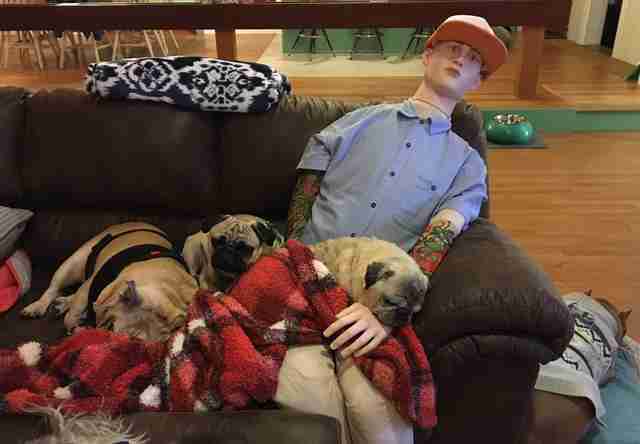 In fact, the stylish dummy has quickly become the most popular “volunteer” at the rescue. Marc still doesn’t see the resemblance — but he’s happy that Shorty’s happy. To help senior dogs like Shorty, you can make a donation to Vintage Pet Rescue here.